Popular, and adorable iron tote allows you to pack up your hot iron and go...no waiting for it to cool, no wrestling with dangling cords. 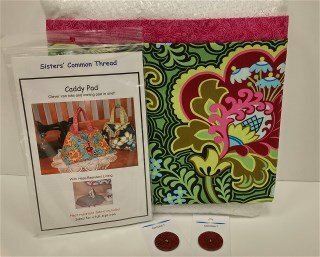 Kit includes Main fabric, Heat Resistant Ironing Board Fabric, 2 buttons 1/4" elastic and Contrast Fabric for binding. Sized for a full sized iron. Iron not included.